The Brussels Griffon is also known as Griffon Bruxellois, Griffon Belge, and Petit Brabançon—three different types of the same breed. Common nicknames for the breed are Griffon or Griff. The Brussels Griffon was developed in Belgium from a terrier-type dog called the Smousje and their function was to hunt out rats and mice in stables. In the 19th century they were bred further with both the Kink Charles Spaniel and the Pug, to create the Griffon as we know it today. 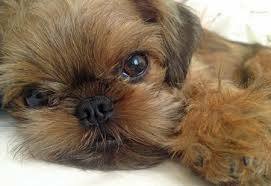 The American Kennel Club (AKC) recognized the Brussels Griffon in 1900. The Griff is really a family dog and loves nothing more than to cuddle, however, they very often pick somebody to be their favourite person and will favour that person over others. They are not known to be aggressive in general, however if treated in the incorrect manner, they will respond with aggression. Being hunters they tend to be independent so early and continued training is always recommended, so that this little one does not become dominant. Some of them tend to be shy and highly strung, so be careful of which breeder you get your pup from and do read the articles on Responsible Breeding, and Tips on Choosing a Puppy, to further educate yourself. What one has to become aware of with this breed, is that they may become what we call 'velcro dogs' - they just dont want to be aware from their person, and this in turn can lead to separation anxiety, so make sure you practice lots of Alone Time training right from being a pup. Although they are small and look cuddly, these dogs surprisingly heavy and very athletic. They do well in agility, performance sports and also obedience work. They are often called little 'monkeys' and this is not from the way they look, rather that they are keen climbers and well known for climbing up on things and getting into trouble! ​Although very cute and cuddly looking, this breed is really not for everybody. The best home for the Griffon is one where it will be given the love it needs, but still be trained to be independent and not become a velcro dog and the owner does not give in to the constant demands for attention. They are notoriously difficult to house train, so this needs to be well supervised and done in the correct manner - to reprimand a Griff can lead to aggression. No dogs should be punished for inappropriate elimination, rather teach the dog using positive reinforcement methods and total consistency. Training can be challenging as this can be very stubborn. Short sessions, brought into the daily routine, using positive reinforcement methods is the best approach. Due to the possibility of them being shy and highly strung, and aggressive with people if the dogs perceives it may be handled roughly, early and continued socialization is a must. They are good watch dogs, however the barking can get out of control, so early training for this needs to be undertaken. On average does not tend to be aggressive to other dogs, however you must make sure that your dog has been well socialized so that it will accept another dog into the home, as they can be aggressive towards strange dogs. The Griff will get on well with other dogs in the family as long as they have been socialized with them as a pup. They tend to be aggressive towards dogs they dont know, so early and continued socialization is a must. If you are considering bringing in another dog into the family, bear in mind that due to the Griff's small size, it can be easily hurt with a bigger dog breed. The Griff can get on well with cats if introduced as a puppy. However, this dog was bred to go after rats and mice, so small family pets are not recommended. This depends very much on the individual dogs temperament, the breeding, the amount of socialization that was done, as to how this breed will react to children. Especially as it is a small breed, the kids need to be taught how to handle it, as if the dog fears being hurt, or treated harshly, it can easily react with aggression. Small children who may run up to a dog to give it a hug or kiss, are better kept away from this breed, until taught the correct manner. Additionally, the child could easily hurt such a small breed dog. Another things to be aware of is that this dog does love to cuddle - but on its terms, not the person wanting to cuddle it, so be aware of this especially where kids are concerned. Don't let this breed demand attention or it will become over dependent and possible develop Separation Anxiety. It should be taught to be alone for periods of time right from being a pup.